Registration and availability via Booking Link. Please scroll to the bottom of the page to book. Experience a deep and blissful state enhanced by the power and Magic! of gong and other sounds! Please note: There will be a maximum of around 8 participants and the gong bath will be around an hour. Advance booking is essential. Wear loose comfortable clothing. Bring a blanket, a bottle of water and cushion or pillow for total relaxation and warmth. During the gong bath, body temperature can drop quite rapidly. Feeling warm, comfy and cosy can enhance the experience. Yoga Mats supplied although you are welcome to bring your own for added comfort. Scroll to the bottom of the page to make your booking. All major credit cards and paypal are accepted. Facilitator – Odette Kurland. A Gong Master and Energy Healer (Reiki Master, Rahanni and Spiritual Healer) She has trained with Don Conreaux , Sheila Whittaker (author of several Gong Healing books) and other teachers including Tom Soltron and Abby delSol. 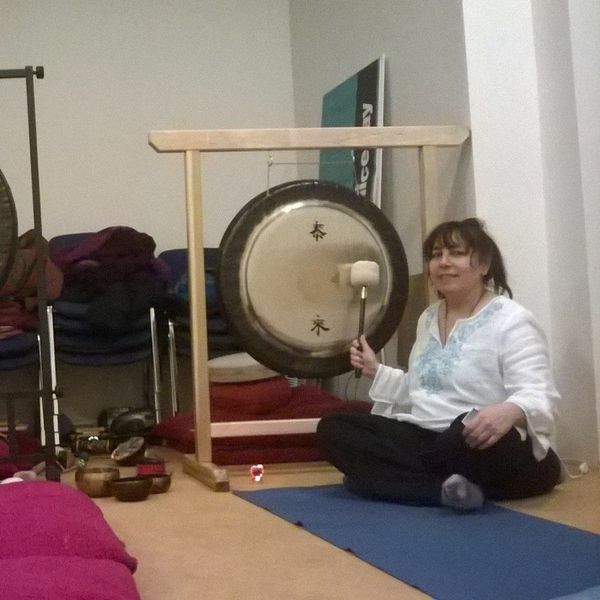 Odette was also involved in the organising of a Gong Concert and sold out Workshop for her teachers from Tone of Life and Don Conreaux in London, 2015.